Scripture, the writings of the Church fathers, and liturgy are at the core of the community life. For this reason Biblical, Patristic, and liturgical research, as well as the edition and translation of Christian sources have developed since the founding of the community. 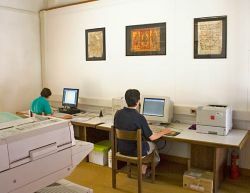 Since the first years of monastic life at Bose, several brothers and sisters have devoted their energies to the study of Western and Eastern languages, both ancient and modern, in order to read and translate Biblical texts and Patristic writings. As a result, through the publications of our publishing house Edizioni Qiqajon, precious treasures of the Christian spiritual tradition, which have been at the heart of the community spiritual life for many years, can now be offered to our guests and friends. This research, even if based on solid, intellectual training, is not aimed at a merely intellectual knowledge at all. Its only purpose is to draw spiritual wisdom from Scripture, the fathers, and liturgy, as the monastic tradition has always pointed out.